Stone type: Find-grained, very micaceous, finely bedded, flaggy, yellow to light grey sandstone. 62cm (24.5'') high, 160cm (63'') in width, and 18cm to 11cm (7.1'' to 4.3'') in depth. 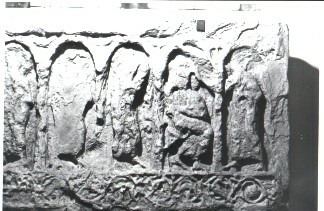 Shrine slab dated to early ninth century. There is an eight-fold arcade carved on this slab. A flat, plain moulding, runs along the top and sides of this and on the bottom there is inhabited plant scroll. The figure in arch 5 is very damaged and difficult to make out, may have had a halo. The figure in the next arch is facing to the right and the head is hooded. The fore-arms may be raised before the head or else they are holding a swaddled child. The figure in the seventh arch is seated on an X-shaped stool with its right hand raised to its chest. This figure has a halo. The last arch has a standing angel facing left. Its right arm extends behind the pillar to the seated figure. Hawkes suggests that these are a Resurrection scene. Lang, J., York and Eastern Yorkshire. Corpus of Anglo-Saxon Stone Sculpture, Vol. 3 1st, Oxford University Press, Oxford. (1991) England - Civilisation, Crosses, Sculpture, Anglo-Saxons..